A big hello to all from hot and sunny Naples, Florida! My name is Cory Dunn, and I am thrilled and honored to join the staff of Gulfshore Playhouse for the 2015-2016 season as the Production Manager. As a recent graduate of Florida State University (Go Noles! ), Gulfshore Playhouse has welcomed me with open arms and allowed me the opportunity to serve “Theatre with a capital T” in this wonderful, art-supporting community. With this past weekend’s opening of our production Boeing, Boeing just getting started, I thought I would share my behind-the-scenes experience as Production Manager on one of the theatre industry’s most collaborative and challenging aspects: Tech Week. For those unfamiliar with the term, Tech Week in common theatre nomenclature refers to the week leading up to opening night. For most theatre companies, including Gulfshore Playhouse, Tech Week is the first time actors get to rehearse and work with all elements of the show; combining sets, lights, costumes, props and sound with actors to really start piecing together the final product. As Production Manager, my job is to make sure that all of these pieces (as well as the respective departments that create and maintain them) combine smoothly and coordinate together to create a seamless final piece. My number one goal is to make sure that everything is occurring in accordance with our schedule and that all of the elements of the production are present and accounted for in a quality product that we can proudly share with you. When it came to Boeing, Boeing, our fantastic team of guest designers and our wonderful staff made my job pretty easy! 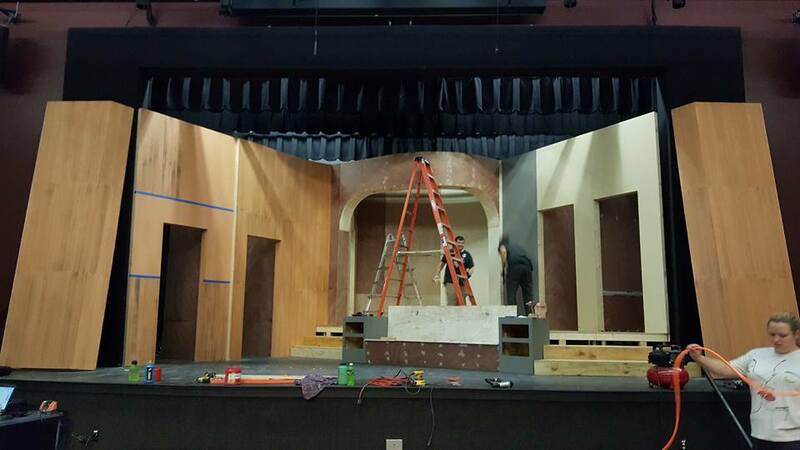 All departments were on top of their game, loading in the set to the theater and hanging and focusing lights with efficiency while the costume and sound departments prepped their materials for ten hour rehearsals on the Tuesday and Wednesday of Tech Week. While the actors became oriented with the stage and new elements during the days, our hard-working scene shop staff worked overnight to put finishing touches on paint treatments and props so that we were show ready. When an extra hand was needed, I jumped right in to keep the ball rolling, even joining an overnight call myself! As we reached Thursday, it was time to start tucking tools back into the closet and working with the Front of House team to create the theater’s seating space and to make it as clean as possible following a hectic and busy work week. After preview performances on Thursday and Friday, we held production meetings with department heads and our lovely director, Julia Gibson, to discuss any small details that needed addressing or any items that had gone awry during our first performances with an audience. We continued to tinker and adjust paintings and glasses and light intensities all the way up to our grand opening, leaving us with a finely tuned production fit for our loyal patrons. Tech Week is often considered the toughest week of any production, especially for the production staff and design team. However, when you are as blessed as I was with Boeing, Boeing, an innovative design team, an extremely talented cast and the extraordinary staff of Gulfshore Playhouse, a tough Tech Week is out of the question! I hope to have the chance to meet all of our amazing patrons following our Tech Week for our next production, Jacob Marley’s Christmas Carol, and have the opportunity to continue sharing the awesome work our staff creates behind the scenes at Gulfshore Playhouse!